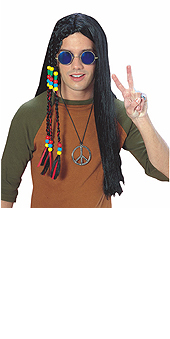 No truly peaceful activist or sixties fashionista would be seen without the perfect Peace Sign Pendant to complete their hippie costume! This tin peace pendant on a black faux leather strap will add the finishing touch to your sixties costume and let your pals know you're against the war, man! *One peace pendant made of tin on a leather-look neck-strap.